The fifth WSLA residential week was hosted in June and welcomed 35 women leaders based in 14 countries to the Bognor Regis campus of the University of Chichester. The residential is a unique development opportunity for women leaders from around the world to step up, take the lead and make an impact. The programme was organised, supported and delivered by the University, AWF and Females Achieving Brilliance (FAB). By the end of the week, the participants had further developed confidence and competence in a range of leadership behaviours, produced a Personal Development Plan with clear goals, developed career strategies, participated in regular networking, and improved their intercultural understanding and knowledge of issues affecting women and sport. Joining Lucy and Pauline from FAB was a large facilitator support team predominantly comprised of graduates of WSLA: Linda, Jo and Jane (2014), Jade (2015), Jill and Tikwiza (2017). From the AWF, Lombe was also a facilitator, Jordan was chair of the local organising committee, Lucy coordinated the event, students Ciar and Callum led on social media, and Anita contributed to the programme. WSLA 2018 also joined forces with the Women’s High Performance Football Centre based at the University for a parallel event for women football leaders in Sussex and Hampshire. 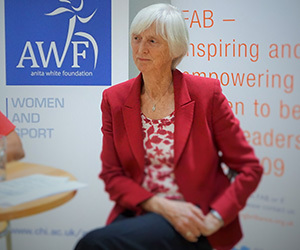 Baroness Sue Campbell CBE (pictured) participated in the event before being the guest speaker at the WSLA Celebration Reception. She captivated the one-hundred-strong audience with reflections from her journey as a physical education teacher to Chair of UK Sport, her appointment to the House of Lords as an independent Crossbench Peer, and her current role as Head of Women’s Football at The FA. As with previous years, the AWF was able to support the attendance of participants who encounter challenges in trying to get to WSLA. We provided scholarships to six women (Anne and Dorcas – Kenya; Grace – Zimbabwe; Sindhura – India; Tolulope – Nigeria; Gomadevi – Nepal) and covered the travel costs of Gomadevi too. Additionally, we financially supported WSLA 2017 graduate, Tikwiza (Zambia), to return as a trainee facilitator. Below, some of these AWF-supported participants reflect on their WSLA experience. "It was an honour to be a recipient of an AWF scholarship. From the moment I put on the name tag, the experience had a profound effect on me. It was a participant-centred with sessions and issues taken by professionals with a diversity of training and experience. It was like a magnet that attracted people of various backgrounds to be introduced, learn, share work, personal experiences and just to smile. I arrived back in Nigeria sodden with the lesson that though we may appear, think, and speak differently at heart; all humans share the same hope, pain, and joy. The AWF’s kind gesture has not only boosted my confidence but renewed my enthusiasm and zest for the job. I would like to assure you of my continued sincerity and dedication." "I now regard myself as a phenomenal woman and am working with my team so they can also believe more in themselves as phenomenal women. I am planning to organise mini workshops borrowing from various sections of the WSLA programme. Thank you, AWF, for providing this platform. The seed planted will surely GROW." "I was very happy to represent my country in the field of leadership in sports for women with disabilities. My journey would not have been possible without the financial support of the AWF. Attending this leadership training has played a very pivotal role by helping me recognise my weaknesses and strengths in the field of leadership. It helps me to know about myself and how I could be an addition to my organisation to achieve clearly set goals." "After two failed attempts to travel to WSLA from Zimbabwe between 2016 and 2018, I was so excited to receive the AWF scholarship. It was to me an endorsement of my potential to be a leader in sports. The week-long Academy was an eye-opener and a period of self-discovery of the leader in me l had not seen over the years. It is an amazing sanctuary where leaders are open of their weaknesses and emotions away from judging eyes and where women impressively build each other. It is because of the Academy with sisters across the globe that l have the confidence to believe myself as the Champion for women sports in Africa." "WSLA is a cultural melting pot, which provides a space for women in sport from across the world to develop their leadership skills and competencies, share their experiences and learn from each other. As such, they bring a depth of insight and experience, which makes for a stimulating environment. Having attended WSLA as a participant in 2017, I was able to return as a facilitator due to the incredible support provided by the AWF. As a trainee facilitator, I had the privilege of participating in two days of facilitator training before residential programme began. The training helped develop my facilitation skills, build my confidence, and provided me with a toolbox resources of I can use in the future. The days following the facilitator training were filled with many ‘ah ha!’ and ‘lightbulb’ moments as key leanings from the training started to come to life. The support provided by the facilitator team was incredible, and I found myself constantly stepping out of my comfort zone, face my fears and further enhance my learning. I returned from WSLA energised, full of ideas and eager to continue advancing the cause of women in sport leadership. I gained new contacts, friends and family and look forward to continue engaging with them. I am deeply grateful for the support provided by the AWF, which made it possible for me to attend WSLA 2018. It is through opportunities like this, that women leaders in sport are developed, and equipped to make a difference in their spheres of influence."